Ginseng is a perennial herb that grows in the Laurel Lake area. 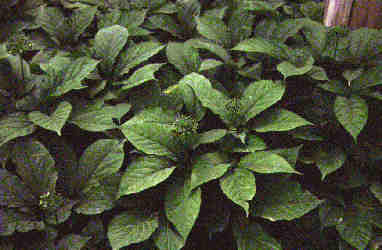 It is a low growingplant with 3 to 5 leaves on top of the plant. Ginseng has been used for medicine in many countries throughout the land. Many people feel that ginseng is a panacea, but its true medical value has never been scientificallyproven. 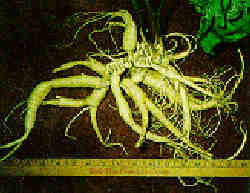 Ginseng has a long, fleshy root. The root is the part of the plant that is soldcommercially in the United States. The root of the ginseng is said to resemble the shape of the human body. The leaves are compound. Each leaf consists of 5 leaflets. Ginseng is used in hair tonics, teas, soft drinks, shampoos, and skin care products. 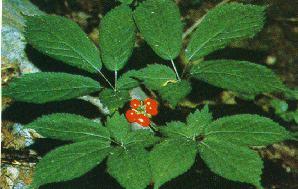 In the fall of the year, the ginseng plant has red berries on it. Most ginseng is exported to China.